There are 5 cottages: (1) One bedrooms, (3) Two bedrooms, (1) Three bedroom. “Starter Supplies” (so you won’t have to shop upon your arrival, or if you choose to bring items you know you’ll use more of than what is furnished) include: 1 guest bar soap, 3 rolls toilet tissue,(no personal towels or washcloths), 1 container dish soap, 1 can kitchen cleanser, 1 grill brush, 1 dish towel, 1 dish cloth, 2 hot pads, 1 tablecloth, salt/pepper, 2 garbage bags, and an oilcloth for the outside picnic table. Pets are not allowed in the cottages. There are boarding kennels nearby. Cottage rentals run from SAT.- SAT. Nightly rentals when available. If you’ve ever daydreamed of being in an “up north”cottage, located on the shoreline of a beautiful, natural lake where the sound of the waves gently meet the awaiting shoreline, causing a musical, comforting rhythm, while in the silent distance you can hear the distinct mournful calling of a loon….you’ll want to stay in the Norway cottage. You’ll wake in the morning to only the sounds of the birds and the breeze. The scent of pine greets you and the view of the quiet lake invites you to take only a few steps to be next to it or climbing in your boat for a memorable day of fishing and adventuring. For a nostalgic trip to days gone by, you’ll want the experience of visiting the Old Log cottage. 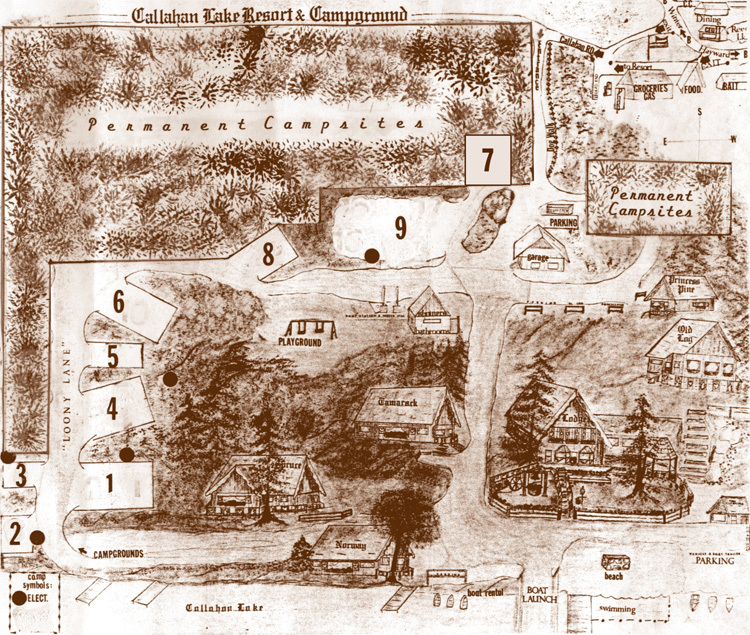 The first cottage built at Callahan Lake Resort in 1937 it holds a charm like no other. Yet, it holds all the comforts of the other cottages, thanks to two caring carpenters who were determined to renovate this landmark without destroying it’s integrity. This cottage is privately tucked back a bit, but still has a view of the lake, and you’ll be lakeside within a few steps. It’s a very favorite of many guests. A romantic little get-away cottage with a private courtyard for your crackling bonfires. The floor plan of this cottage also holds the flexibility of sleeping arrangements for extra persons. It is located in a quiet corner of the Resort and is a short walking distance to the lake. Out the door of the Spruce cottage you’ll take about 10 steps and be lakeside on one of the most natural, breathtaking lakes Mother Nature has provided! Viewing the lake from your picture window will give you a sense of peace and belonging. A great family get-away-together place! 2Bedrooms with double beds, 1 bedroom with bunk bed, plus one queen hide-a-bed.